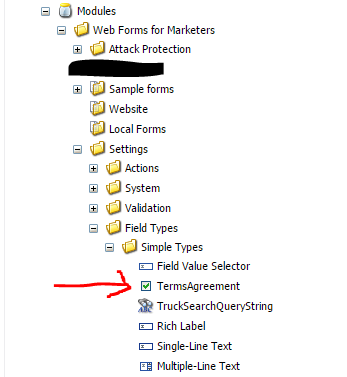 Recently the Web Forms For Marketers Module for Sitecore has released support for MVC. With that, lets go over how to create a custom type to be used on your MVC form. First you’ll need to add a new type under the Field Types folder. Now in your Visual Studio project, create a new class TermsAgreementField.cs that inherits from CheckBoxField. Note here that I have made this a required field by making IsRequired always return true.